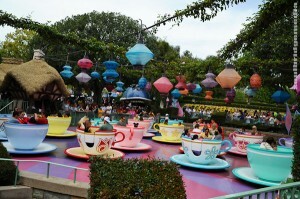 On to something a lot more innocent and pretty much a must when hitting Disneyland… the Teacup ride, as part of Fantasyland! So simple yet so fun, even the most motion sickness prone will have no problem on this ride as you can control how fast the cup spins, via a “steering wheel”. Wait time was around 20-30min. 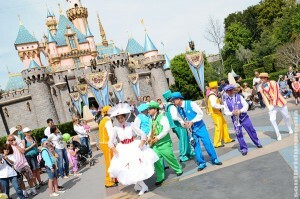 Hang around the castle entrance for song and dance routines from Disney classics like Mary Poppins and later in the evening for the closing fireworks. Try as you might but you’ll be hard pressed to escape Sleeping Beauty, Snow White and Pixie Hollow features without a set of fairy wings or a fluffy glitter wand! Heading towards 12 o’clock on the Disney map clock is a place that would have WHS and building code inspectors in fits but I’d be damned if I don’t want a curved house, rainbow coloured with oversized tiling and supports! 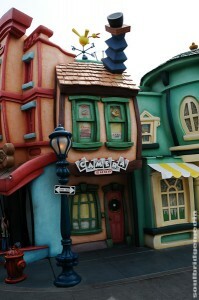 Mickey’s Toontown, is the home to all the Disney toon characters, Mickey, Minnie, Goofy and friends and their wonky architecture buildings where you don’t know whether they’re real or drawn on! In the streets you’ll also see objects and fixtures perfect for a holiday snap, there’s even signs to guide you where to take the photos. 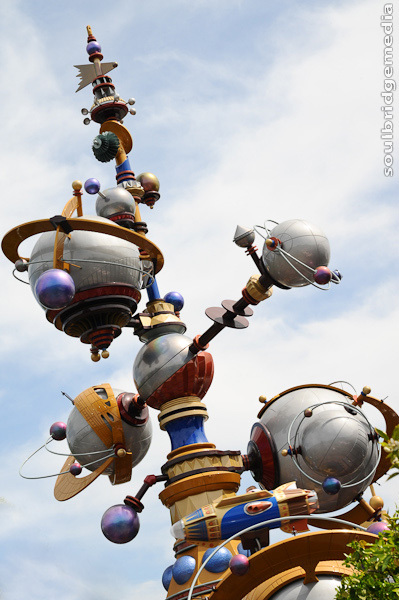 Completing the warped world of toons are random objects like mailboxes and telephones that talk! I don’t know who was on the other end of the line but I was pretty certain if I slammed the phone down hard enough it would explode at the other end. 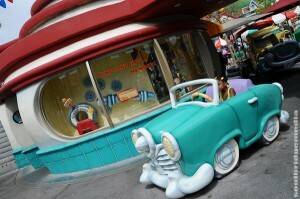 Toontown is also the opposite stop to the main entrance for the Disney Railroad. Continuing on is Frontierland. For some, the highlight would be the Big Thunder Mountain Railroad rollercoaster, for others it would be the Big Thunder Ranch BBQ – an all you can eat meatfest, but alas that too had a wait time of 45min, so it would be best to get in early if you want something to fill you up before you hit the bobsleds. 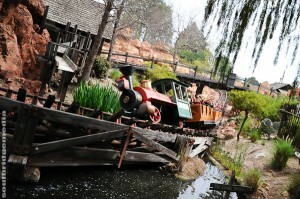 The rest of Frontierland, namely the riverboat and pirate features were closed for maintenance. So, again, if there’s a particular ride you want to go on, make sure you check the schedule for maintenance days before booking. Adjacent lands are Critter Country with “can we go, can we go, can we go to..” Splash Mountain, Adventureland with Indian Jones and more Tiki and tribal paraphernalia than a New Zealand drum and bass gig and New Orleans Square celebrating the deep south in the 1800’s minus the slavery with another staple attraction, the Haunted Mansion. By late afternoon, you’ll more than likely will be seeking refuge from the crowd and from being on your feet all day, then what better way than to spend 20min or so on the Disney Railroad. The train circles the whole of the park and makes 4 stops. 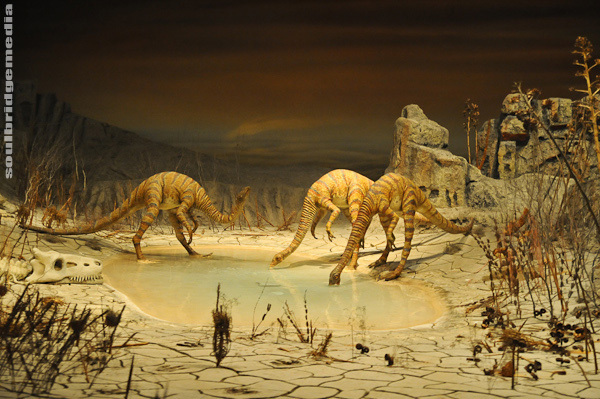 To liven up the journey between the “behind the scenes” areas, there are 2 recreations, one of the Grand Canyon complete with wildlife and the other of a prehistoric era with a variety of dinosaurs, both very impressive and look very realistic. They come up and go by rather quickly (depending on the enthusiasm of your driver) so have your camera at the ready. At the end of the day you can choose to fight the rush at the souvenir store at the main entrance, hang around for the closing parade and fireworks or you could pick up your gifts through out the day and choose to get back to West Hollywood for more shopping, then you’ll want to beat the rush and step out a little early. 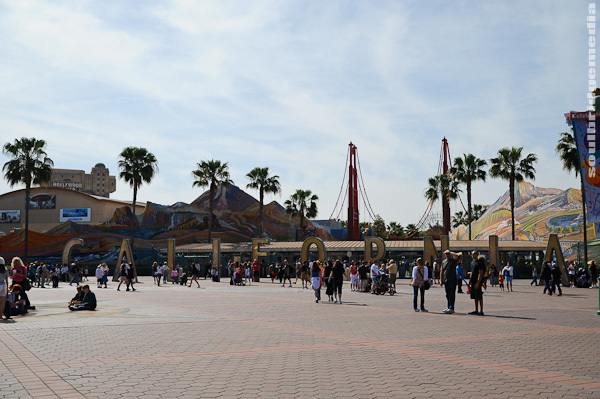 So that concludes a big day at a big theme park and the end to the Los Angeles stop. Next up, its time to start spreading the news, we’re going to wake up in a city that never sleeps to find we’re king of the hill.. A number one…. NEW YORK CITY. What is there really to say about it? 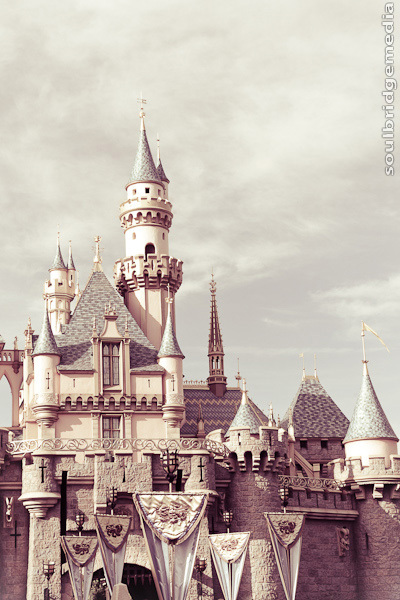 Its Disneyland. 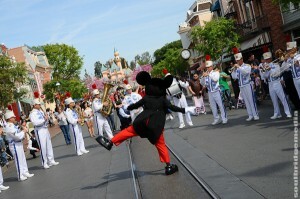 You cant really hate on the “happiest place in the world” can you? Sure the lines are miles long and prams/strollers out number people but you’ve gotta be dead inside if you don’t want to don some mouse ears and skip everywhere you go! Firstly, some advice on planning your day. Once you’ve decided that you’re going, or your girlfriend/kids have nagged you so much you just want to shut them up :p you need to decide where you want to go and for how long. 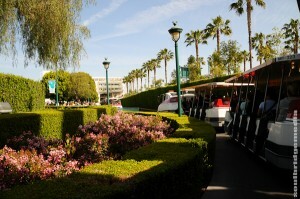 For the uninitiated Disneyland consists of 2 theme parks, Disneyland and California Adventure. 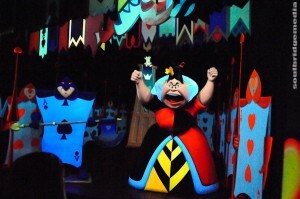 Disneyland is the classic Disney character affair while Cal Adventure is all the thrill rides and is targeted to the bigger kids. With only a day to spare and a gaping hole in my childhood we went with the classic. The best way to get some kind of discount is to prepurchase your tickets and get it combined with a “tour”, which is basically pick up and drop off from your hotel or one of many pick up points. There are so many of these companies and they make a lot of stops so you wont have any problems getting to and from your hotel. We went with VIP Tours who picked up from our door at Double Trees Santa Monica, all inclusive tickets (travel and entry) were around $100USD. There’s even bigger savings if you get multi-day multi-venue passes, shop around, you’re bound to find something. Also keep an eye out at certain times of the year, even Disney has coupon specials. 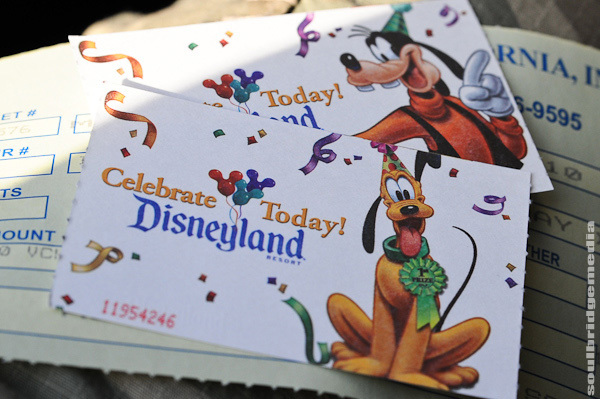 An additional feature is the Disney Fastpass. Basically you pay a premium so you can jump the queue. Possibly worthwhile if you only have one day and want to ride as many rides as you can but otherwise we couldn’t justify the cost since it only works at certain times for each ride, times are posted at ride entrances and of course you’ll be competing with the thousands of others who thought the same thing. For ideas on the best days to visit, there really isn’t too much difference as its always packed. Obviously, avoiding school holidays, weekends and the warmer months will give you some relief but expect between 15-30min average wait time and up to 45-60min on some of the popular rides. Also take note of their park hours schedule, rides can be closed for maintenance and some don’t open in the colder months. 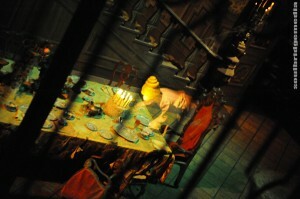 The schedule also shows special seasonal events like Halloween etc. While the lines and the sheer number of people is quite daunting, they are very efficient at handling everything the masses can throw at them and all with a big smile. From the fleet carpark shuttle “trains” and the wall of entry booths to the cleverly designed cattle runs for queuing, its clear that its all been fined tuned after many years of capacity crowds. While a lot of the time it can seem futile, most of the masses move reasonably quickly and orderly, as far as “festival” crowds go anyway. So you’ve made it through the gates, the first thing you’ll notice is the bright vibrant colours of everything and the quirky shapes of buildings and fixtures and a melodic unmistakable soundtrack playing almost subliminally over the PA system. 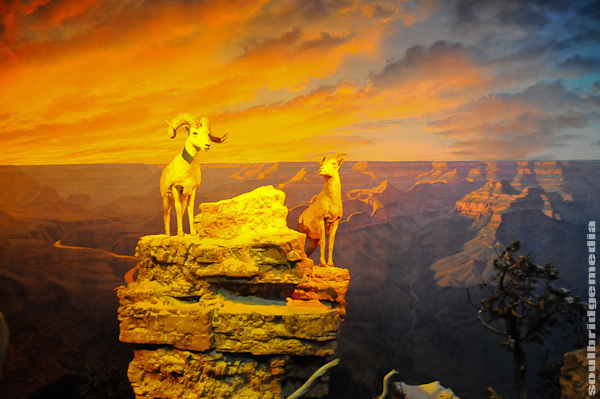 Take a moment to soak it all in, it may be the last bit of peace you get all day :p plus you’ve got planning to do. Some people are happy to just wander around the park and check things out but due to the size of the venue and the spaghetti layout you’ll more than likely miss more than you see. A high recommendation is to, at the very least, grab the daily performance times and a map and make a few pokes at it with a stick (with accompanied four finger direction pointing of course). Its also a time to make note of when and where the performances are and whether you’ll get to them in time for a good vantage point. Also consider grabbing a bite to eat at the café/sandwich bar at the entrance before kicking off, this will help you last pass the normal lunch times and hopefully miss some of the lunch rush. We chose to make a rough anti clockwise zig zag, taking notice of queue times, posted at the entrance and end of queue points at all rides, as we went. In this direction our main priority was the Buzz Lightyear ride, but not before we ran into Mickey’s marching band in Main street. 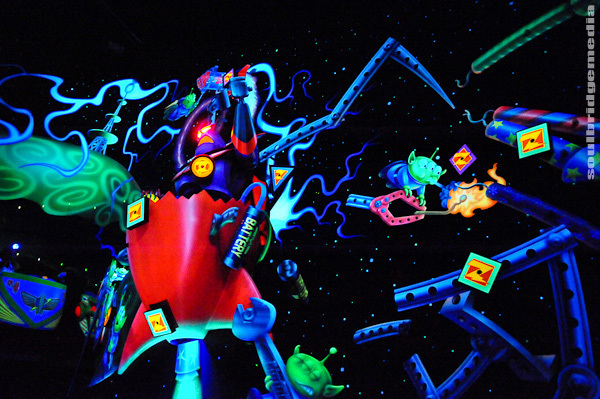 The wait time listed at Buzz Lightyear was 25min but we were through in just over 15min. 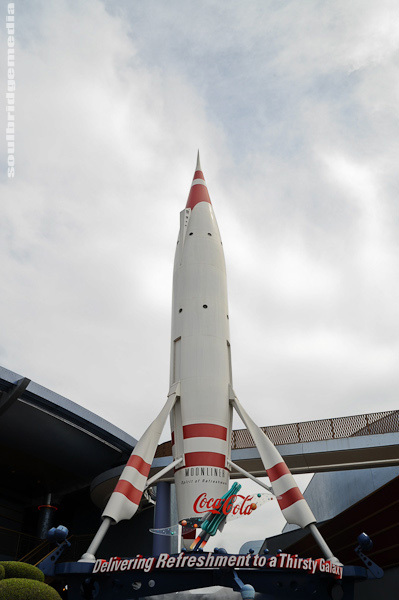 As you enter the ride, like many of the rides, they have incorporated part of it with the waiting queue, to keep you occupied with a sense of “almost there!”, definitely a welcome for those with impatient kids. 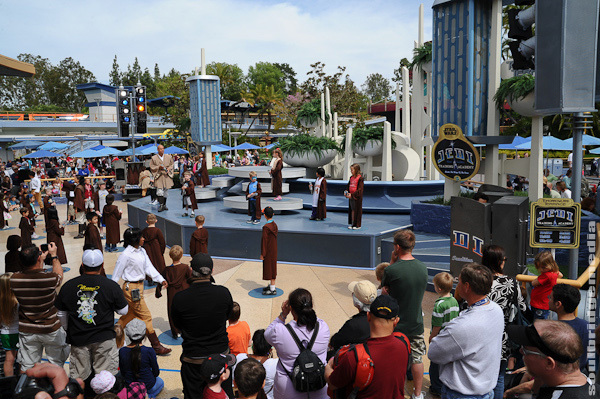 It also adds to the flow and “storyline” of the ride. In this case it was characters from the movies and a full size Buzz animatron giving a mission briefing, “blah blah blah, kill zorg, blah blah To infinity and beyond!”. No probs Buzz, shoot the hell out of everything, gotcha! Now, normally I’m all up for taking out aliens with a eyeball blinding barcode reader gun but with such elaborate and lifelike scenery and characters, I lasered with my left and shot (with my camera) with the right. Photo tip: If you’re thinking of doing the same prepare to use extremely high ISO, I’m talking up to 256000 if your camera can do it, to help your shutter speed manage the movement from the ride and the targets. Also be ready to lose pitifully on the scoreboard! A cool feature on leaving the ride is being able to email an in-game photo of yourself from the ride’s photo booth in the gift shop. 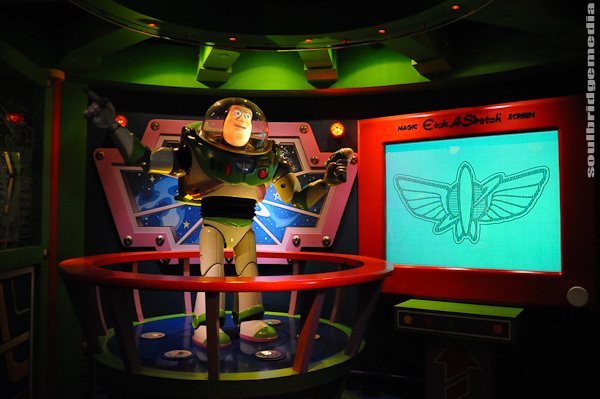 The Buzz Lightyear ride is of course part of Tomorrow Land so you also have all the classic rides like Space Mountain but of course with the classics come the long wait times, most hovering round the 60min mark. 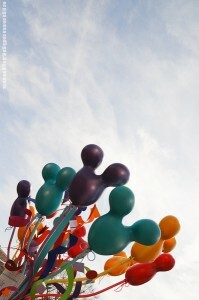 Next up, Fantasyland, Toontown and more!